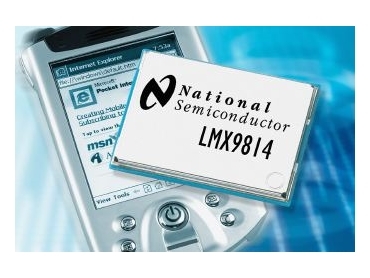 NATIONAL Semiconductor, represented by Arrow Electronics, has announced that its LMX9814 Bluetooth WPAN module is now shipping in the HP iPAQ Pocket PC h5400 series. The module is based on National's all-CMOS Bluetooth wireless technology chipset, which includes a completely integrated Bluetooth radio and a baseband/link manager chip with integrated reprogrammable Flash memory. "We expect that by 2007 worldwide shipments of handhelds and PDAs will grow to more than 30 million units. About three-quarters of these products will have Bluetooth capability," Matthew Towers, senior Bluetooth analyst at IMS Research, said. "Manufacturers are eager to improve the communication functionality of their devices and they are doing it with products like the Bluetooth module from National Semiconductor." National's WPAN Bluetooth module is fully self-contained, allowing HP to easily integrate Bluetooth capabilities into the iPAQ Pocket PC h5400 series. The module measures just 10mm by 14mm by 1.9mm and has low power consumption, contributing to the iPAQ's extreme portability and extended battery life. It is also Bluetooth certified and production ready to support customers' volume manufacturing requirements.